In 2005, as my graduate school journalism project at Ball State University in Muncie, Ind., I published an original Midwest goth and industrial music magazine called Echo Immortalis, which I founded, wrote, edited, and designed. With the help of freelance writers and photographers, I successfully published three 56-page, full-color issues of the music magazine until 2007, when I ran out of funding for the grassroots journalism project. However, the experience it taught me has helped propel me throughout my writing career. Click on images to enlarge text. 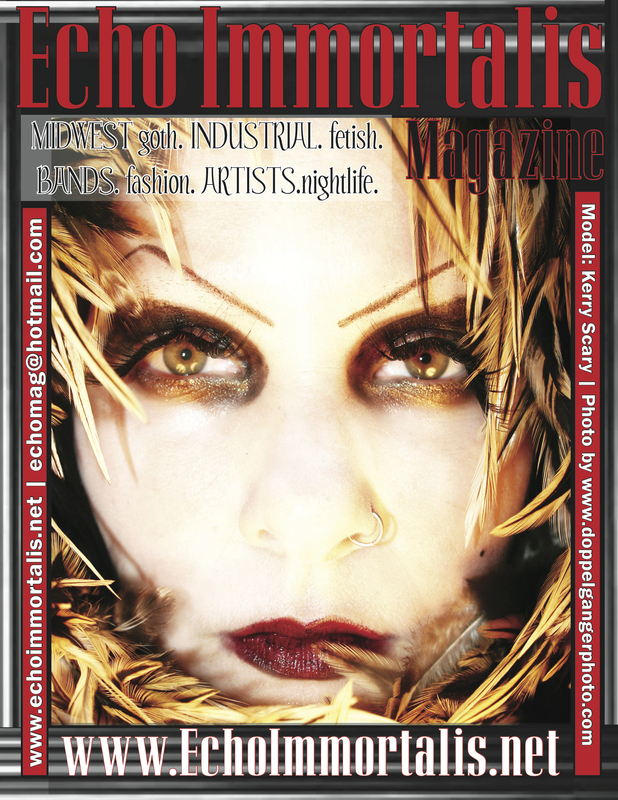 InTake, published by The Indianapolis Star, featured an exclusive interview with me (Leslie Benson, the founder of Echo Immortalis magazine) in 2006. Read “Print it Black” here. Critique by Samir “Mr. Magazine”™ Husni, Ph.D.
-With Input From: Razed in Black, Form 30, The Azoic, Hungry Lucy, Thanatos, Filament 38, Assemblage 23, Y-Luk-O, Produkt, Hardwire, She Wants Revenge, I:Scintilla, Acumen Nation, Dekoy, Dirk Ivens, Mentallo & the Fixer, The Faint, Voltaire, The Oddz, Grigori 3, Mister E DJ, DJ Copper Top, Empress Alyda, Sarah Vain, Matt Greenwood, Kent Caliber, Nick Anderson, Leigh Marino, Jason Saunders, Kelly Parsons, Scott Church, Storm Constantine, Indiana Munch, Chris Conner, Sean Smith, Mark Watson, Ryan Jenkins, Richard Numbers, Jake Textor, Michelle Hickman, Scott Broyles, Mike Schindler, Bliss, Jon Fernandez, Kai, Acid PopTart, Melissa Kennedy, Natalie Norris, Sindel Chaos, Wicked Mina, Lady Valoria, Bella Sin, Regina Russo, CiN, Ebony, Chantal Menard, Bat’s Meow, Jay Fife, M. Rafael Class, Sean Stevens, Jim Balent, Eric Tragedy, Libby Bulloff, 1470s, The Asylum, The Vault, all the other bands, artists and beautiful models who added their flavor to this ‘zine, anyone who helped this grassroots creative endeavor, and the entire Midwest gothic-industrial club scene…Thank you for having made this possible!